A trek to Langtang valley starts with an overland journey to Syabrubesi, a small string of shops and hotels. 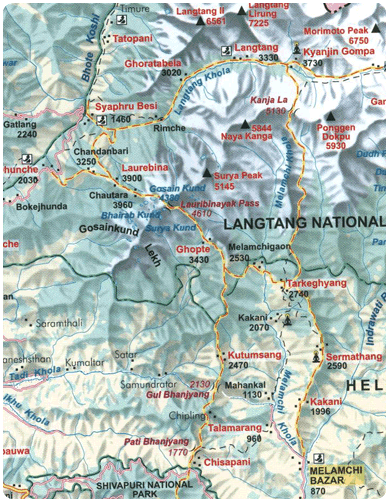 Langtang is a narrow valley that lies just south of the Tibetan border. It is sandwiched between the Himalayan range to the north and a slightly lower range of peaks to the south. This area was designated Nepal’s first Himalayan national park in 1971. 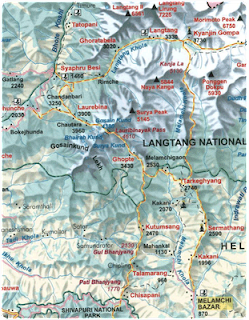 This high and isolated region is inhabited by the Tamangs, whose religious practices, language and dress are more similar to those of Tibet then to the traditions of their cousins in the middle hills. According to a legend a lama following a runaway yak discovered the valley. Hence the name – lang its Tibetan for yak, and teng means to follow. Though is area is relatively close to Kathmandu, the region sees far fewer trekkers than Everest and Annapurna. 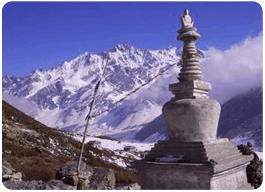 This trek is easily combined with the Gosainkund Trek.